It's only been a month since Raffa's birthday and party (oops! time flies) but I am finally sharing the fun invitations we sent out for his park party turned intimate rainy day at-home get together. I knew that I wanted to do hand-lettered invitations this year and the idea evolved in to a hand-lettered and illustrated set. 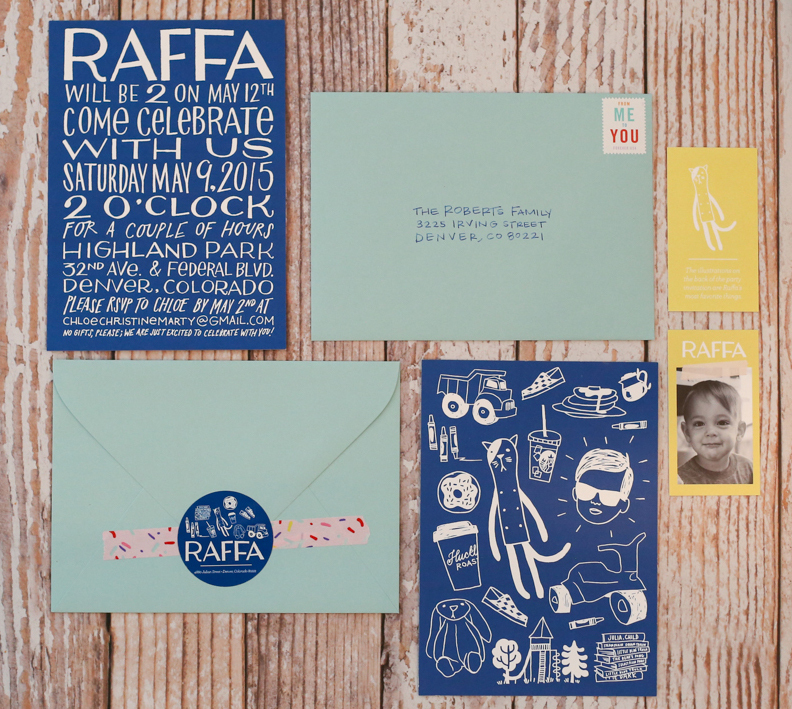 On the front - the party details and on the back - illustrations of Raffa's most favorite things. 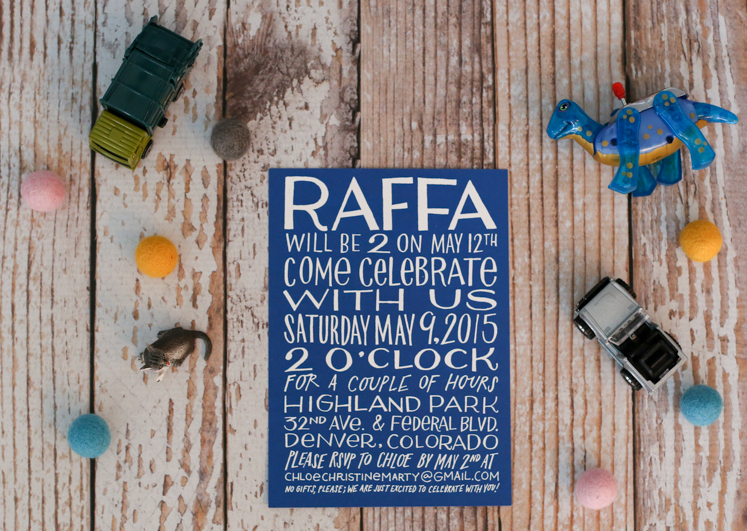 The party itself was a park and donut theme, which covered two of Raffa's favorites. 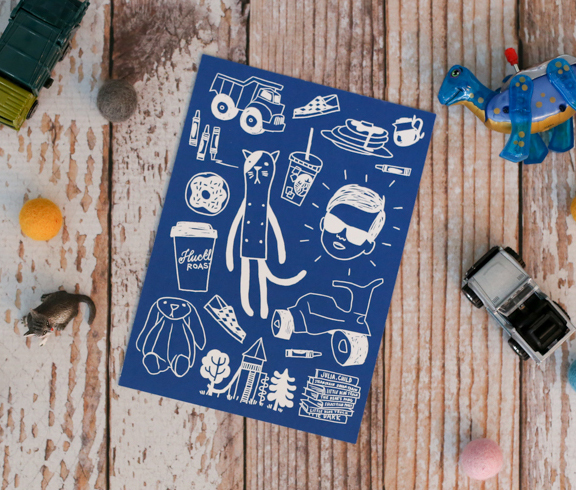 The illustration on the back also included: Raffa's dump truck, his checkered Vans, his crayons, pancakes + syrup, Asher, Starbuck's iced green tea, his Finkelstein kitty, donuts, "coffee" (hot chocolate) from Huckleberry Roasters (the donut + "coffee" also cover Donut Monday, our weekly ritual at Huckelberry), his bunny, the park, his red trike, and reading books. 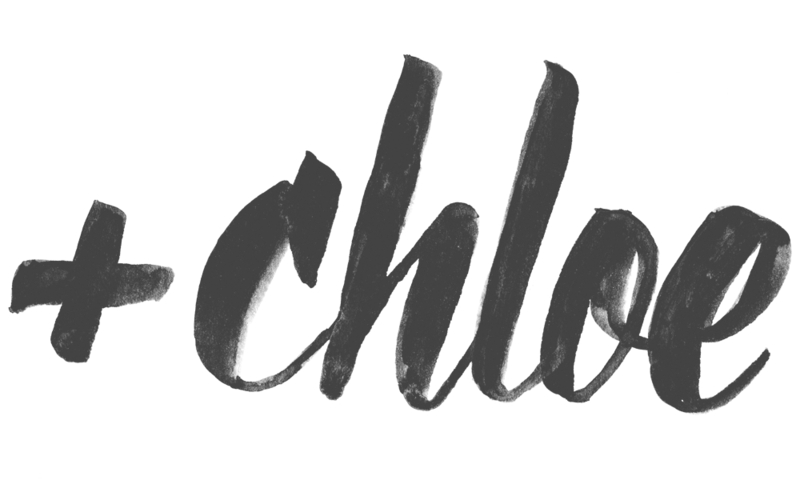 To accomplish the lettering and illustration, I turned to Shannon Snow. 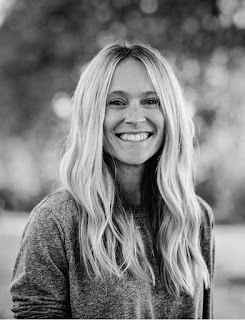 I have worked with Shannon several times and I was confident that she could bring my creative vision to life. I didn't want to do the lettering and illustration myself; I specifically wanted some one else to bring my ideas to life. 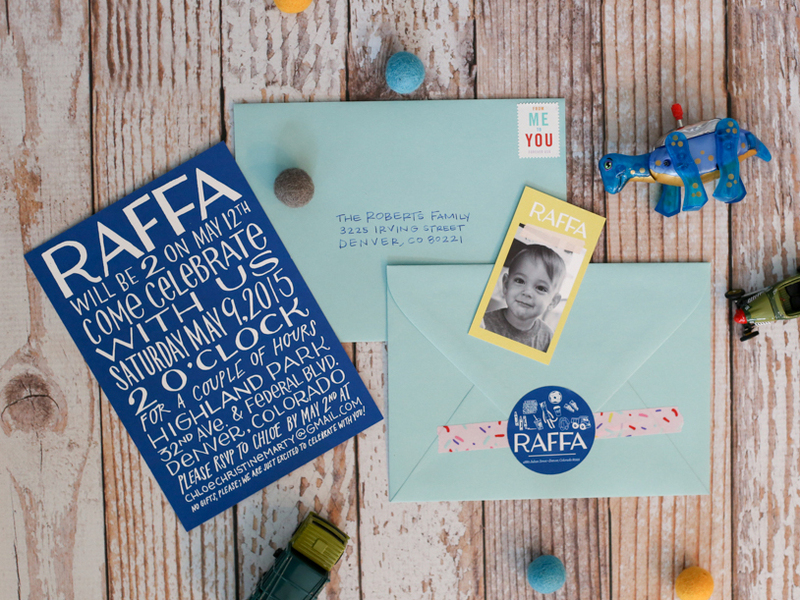 I paired the digitally printed, white and royal blue invitation with a small chartreuse, business card-sized enclosure with a photo of Raffa and an explanation that the invitation contained his favorite things. The mint blue envelopes were sealed with a custom return address sticker and some donut sprinkle washi tape. I hand addressed the envelopes and went with "From me to you" Forever stamps. I had so much fun with designing these invitations this year! 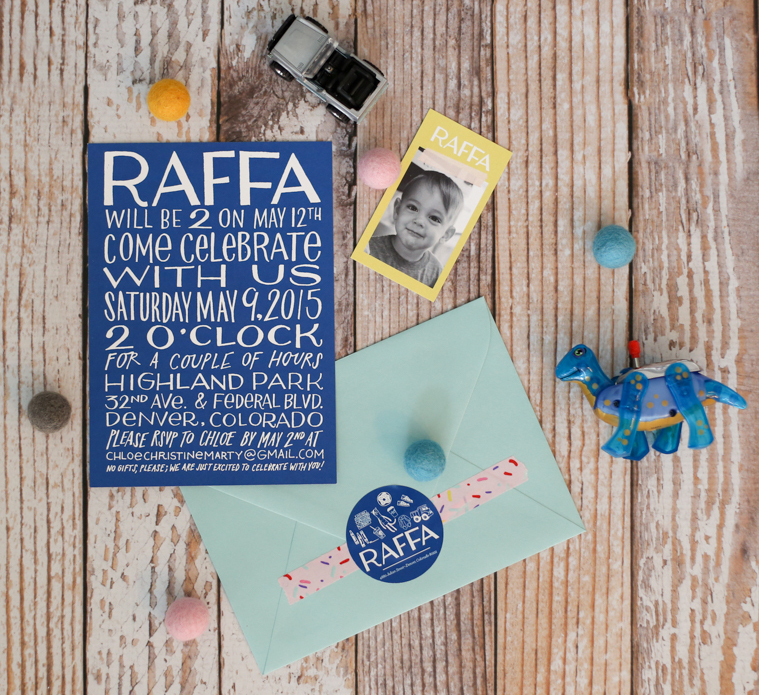 See Raffa's birthday invitations from last year here.